Sonic Dance is a compilation album containing music from various pop and dance groups with varying degrees of popularity in Europe at the time of its release. Though it is branded with imagery from the Sonic the Hedgehog franchise, none of the music is related to video gaming. The tracklist for this album varied from country to country, with three distinct variations known. Curiously, the Dutch version was released by a different label, Magnum, than in other countries, where it was released by Arcade. 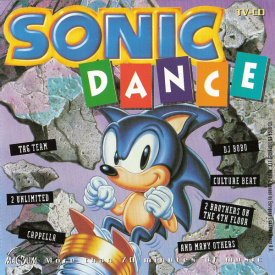 An alternate version of the Dutch cover advertises an opportunity to enter the "Sonic Dance Contest." This page was last edited on 23 February 2019, at 23:02.